… is supposed to have a rainy (eastern) and a sunny (western) coast. So of course I chose to go to the sunny western side of Kailua-Kona. Unfortunately, however, I seem to be a rain magnet as it started raining on the usually dry west coast the second day I arrived on the Big Island. 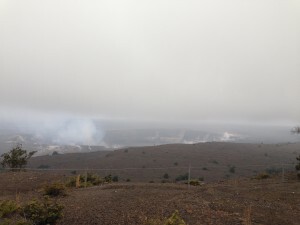 Yet, my whole visit to the Big Island seemed to turn out to be one big disappointment when I heard that access to the volcano was restricted and one could neither see flowing, red glowing lava nor really get close to the crater. But that was THE one reason why I had come to this island and now I was about to be left with bad weather and not seeing the volcano?! This thought was almost unbearable and I could not believe my bad luck. Things changed for the better once again, however, with a visit to the Island Ono Loa Grill, a fantastic burger restaurant in Kona. Asking for poke, the typical Hawaiian fresh fish salad, we got talking to Chris, the place’s owner. He had some big prints of Hawaiian beaches and glowing lava flows hanging on the walls and told us he had taken the pictures himself. 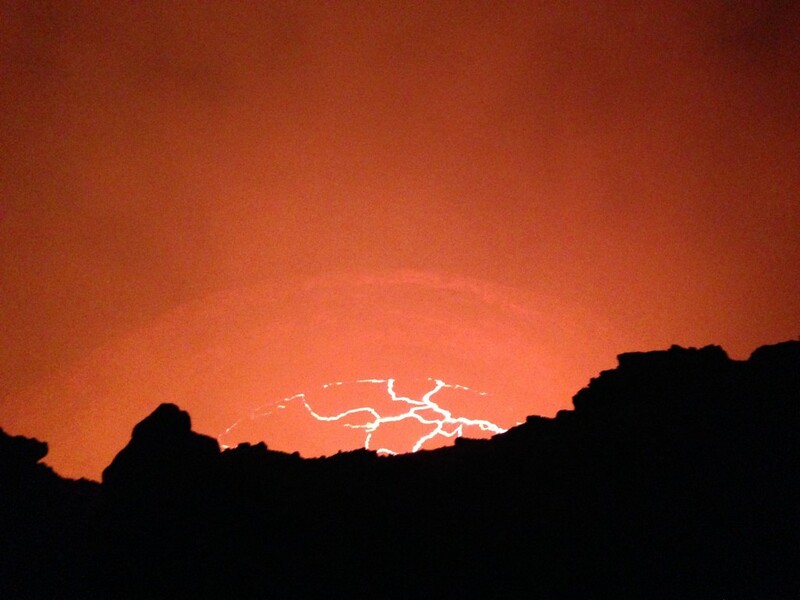 When I told him that I was really sad I wouldn’t be able to see flowing red lava or the volcano itself, a smile crossed his face and his eyes lit up with mischief. 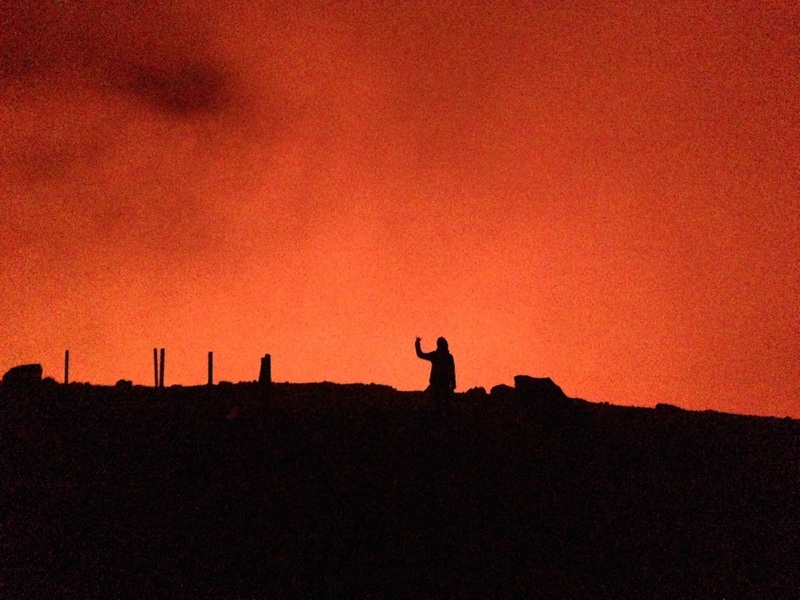 Then he leaned over and said: “If you’re willing to take a small risk, there’s a way.” and then he told us about a way how to get close to the volcano crater. I was all excited about this new chance and hoped to be able to try my luck in the coming days, when we would drive to the Volcanos National Park. So I was still hopeful when we took off from our hostel and headed south, even though it was still cloudy and kept raining every once in a while. Thus, instead of going to the beaches along our way, we decided to stop at some more culturally relevant places. 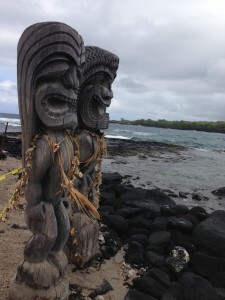 The first one was the Puuhonua o Honaunau National Historical Park, also called the City of Refuge. It’s a former sacred Hawaiian royal ground as well as a place for ancient lawbreakers to seek refuge. After this traditional Hawaiian historic place, we went on to visit St. Benedict’s Painted Church, a catholic church painted by a missionary in 1899. The paintings helped him convey his Christian beliefs, as most of his Hawaiian parish by this time would not be able to understand his sermons in English and he didn’t speak Hawaiian. 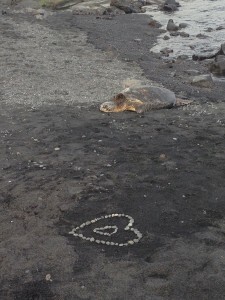 After visiting these two very different sites of Hawaiian history, we drove to Punaluu Beach, a Black Sand Beach, where I was once again lucky enough to see a sea turtle resting on the shore, and another one feeding in the shore break, hanging on to a rock and every once in a wave being swept away. On our trip to the Volcanos National Park we stopped at the most southern bakery of the United States and had a very tasty lunch there, then we drove to the Buddhist monastery, where we would spend the night. It’s kept by one Buddhist monk only, who welcomes travelers into his guesthouse and invites them to join him for prayers and meditation. Unfortunately, we were not at the monastery at these times, but it was interesting to see the offerings at the altar – they ranged from pure water to flowers, chocolate bars and fruits. In the backyard we fed some of the freely roaming peacocks, then we jumped back into the car and were on our way to finally go and see the volcano. We arrived at the park at around 4 o’clock in the afternoon and first drove to the Visitor Center to take a look at the huge crater while it was still light enough. It was a huge areal with a deep round hole to one side of it. As it was a foggy due to the sulphur clouds coming out of the volcano, one could not see very clearly and the sight, even though huge in dimensions, was a little bit disappointing as it did not necessarily look any different from a regular valley in the mountains. Far more impressive were the steam vents which we went to see afterwards. 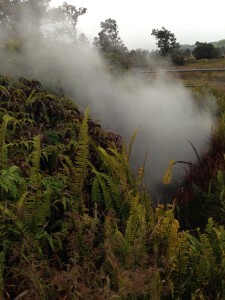 They are holes in the ground where hot steam escapes from the ground – the air is hot and very humid and I could only stand in these steamy clouds for a couple of seconds before needing to breathe normal air again. 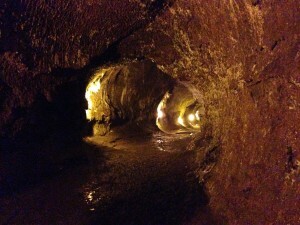 So one can only imagine how hot it must be down underground – or inside one of those massive lava tubes, which form when lava flows and the outside cools down and hardens up so that it forms some kind of isolation tunnel through which the rest of the hot lava keeps flowing. We were able to walk through one of these old hardened lava tubes and it was impressive how huge this tunnel was. 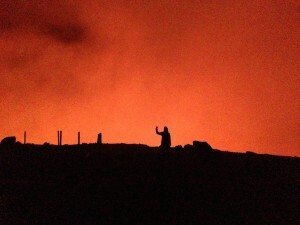 One better does not get in the way of a lava flow I’d say! 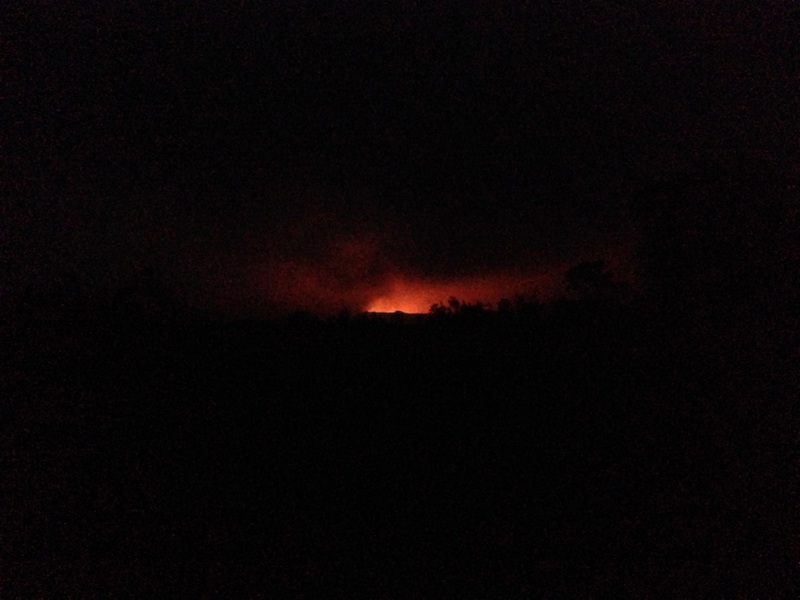 When we exited the lava tube, it started to get dark and we went to the parking lot from where the road to the crater started. Here we packed our torches, warm clothes and some water and set out to a 2 mile walk to the parking lot at the crater’s rim. 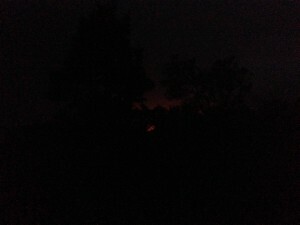 As it was dark we could see a light reddish glow in the darkness far ahead of us. Heading down the road, the glow gave us direction and kept becoming stronger and stronger. 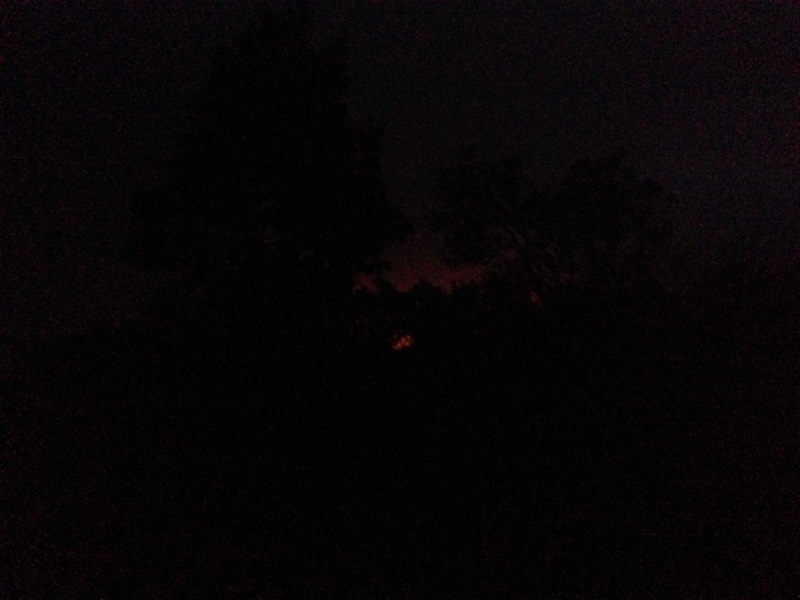 Soon we were able to see the huge steam clouds reflecting the red lava glow from beneath, with the wind luckily blowing them away from us so we didn’t have to worry about being caught inside the sulphur fog. When we finally reached the parking lot, it was nice and warm, and the glow made it easy to see the trail to craters’s rim. What we were about to see then cannot be described in words and I’m afraid even the pictures will not do it any justice. But looking into an active volcano’s crater and seeing the lava boiling and exploding, is awe inspiring and incomparable to any other sight in this world. It’s like taking a glimpse at primeval times, at the beginning of our earth, into the deepest core of our planet. It is fantastic, beautiful and scary all at the same time. 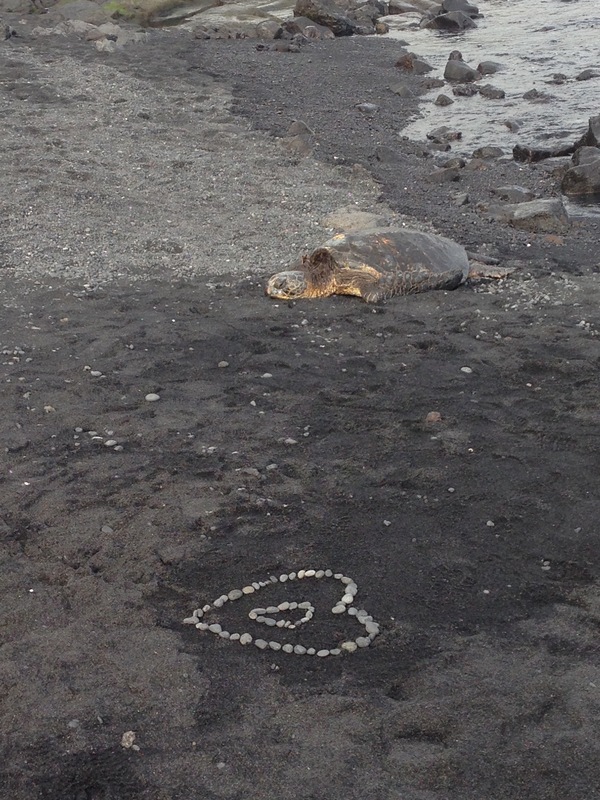 And for this experience I am forever grateful that I went to the Big Island. We went back in absolute stoke and could not believe our luck, as soon the clouds settled in and the magical red glow was hidden by a strong fog which would obscure sight for more than a few meters ahead. Once back at the monastery I fell into bed filled with the warm afterglow of my most special experience ever. On our way back to the hostel the next day we went to South Point, the most southern point of the United States, and spent a nice afternoon and the last amazing Hawaiian sunset at the beaches of the Kekaha Kai State Park, where we once again were visited by some sea turtles. 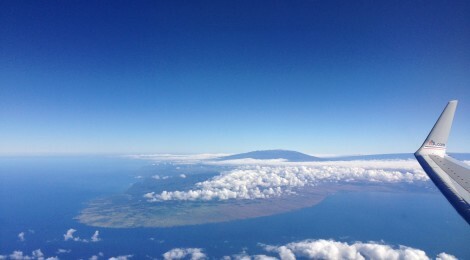 The next and final day I was able to say a proper goodbye to the Hawaiian Islands with a yummy bowl of poke and a most stunning view over the snow decked mountain tops of Mouna Kea and Mouna Loa from the airplane which would take me back to LA.